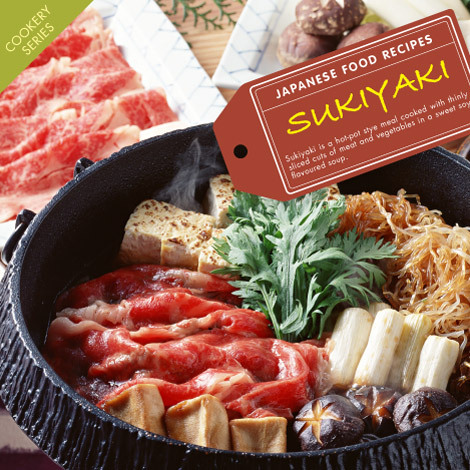 Sukiyaki is a hot pot style meal cooked with thinly sliced cuts of meat and vegetables in a sweet soy flavoured sauce. Just as tasty served as a vegetarian dish without meat, Sukiyaki is a versatile meal that is ideal for those cold winter nights. Similar to Shabu-Shabu, it’s a socialale dish that can be cooked in the centre of the dinner table. 1. Start the preparation by cutting all ingredients into small bitesize pieces. 2. Heat up a large pan and lightly grease the base (either with suet or normal vegetable oil). 3. Add the thin strips of beef or pork and start frying them gently. 4. Once the meat is nearly cooked, add the Sukiyaki sauce to the pan. 5. Finish by adding the rest of the ingredients once the sauce starts to boil. 6. Leave the items in the pan to simmer and cook for a few minutes. 7. Once everything is ready, dip the cooked Sukiyaki into fresh raw egg and eat. OR if you don’t want to dip in raw egg, hard boil the eggs and eat them on the side. 8. It is usually eaten over a bowl of warm cooked white rice. Posted in Food and tagged hot-pot, recipe, Recipes. Bookmark the permalink.